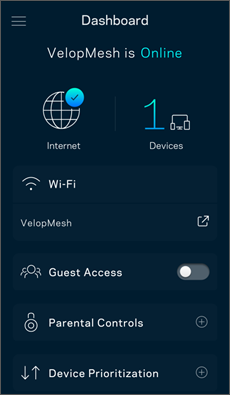 The Linksys app dashboard is the first screen after the app launches and offers a snapshot of your Velop system. You can see how many devices are connected to your Velop system, share your Wi-Fi password, and allow Guest access to your Wi-Fi. The dashboard also shows you if any devices have Parental Controls on them or have been prioritized for Wi-Fi access. 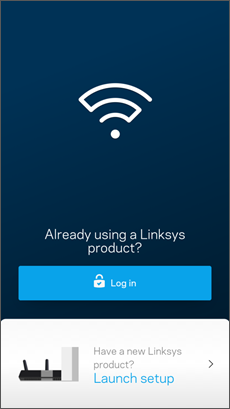 This article will show you how to access the dashboard on the Linksys app. If you want to access the Velop’s web interface, click here. NOTE: Before you begin, make sure that you have a working Velop system and the latest version of the Linksys app is installed on your mobile device. 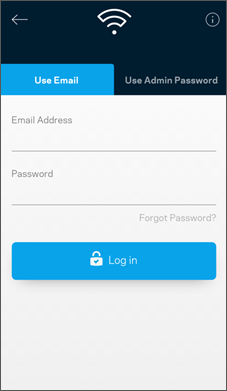 Enter your email address and app password and tap Log in (to log in via the internet). To access the Velop system directly (not over the internet), tap the Use Admin Password tab and enter your credentials. After logging in, the app will take you to the dashboard. NOTE: If you are unable to log in using the admin password, try to log in using your email address and change the admin password. For instructions, click here. If you have forgotten the password that goes with your email address, click here for password recovery instructions. Tapping the Menu icon displays more settings. When you are logged in via the internet, you will have a My Account option. To log out, just tap My Account > Log Out. When you are logged in via the Velop admin password, you will have a Log Out option.